Unassuming Socks are not spectacular. They don’t incorporate complicated lace or intricate cables, and they’re not replete with fancy colorwork. 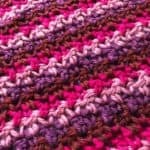 They simply feature an easily-memorized four-stitch, four-row repeat consisting solely of knit and purl stitches. But unspectacular doesn’t have to mean boring: the textured pattern is attractive without requiring too much effort or concentration. So what does make Unassuming Socks special? Well, they are, in a word, unassuming. They don’t assume that the recipient is male or female; they’re delightfully unisex. 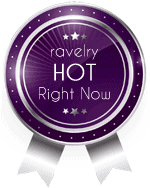 They don’t assume you’re a sock veteran; instructions are thorough enough for even a newbie. They don’t assume you want to spend a certain amount on yarn; they’ll look equally great in a luxury hand-painted yarn as they do in the affordable Cascade Heritage—swap freely, friend! They don’t even assume a particular needle setup; you can use your preferred method for working in the round without altering the instructions. What do Unassuming Socks assume? They assume you can knit, purl, slip stitches, do basic decreases (k2tog, p2tog, and ssk), and graft, or that you’re willing to learn. They assume you want to work to a custom foot length rather than to an exact row count. They assume you can achieve the specified stitch gauge, or that you are comfortable modifying the pattern to suit your gauge. That’s about it! Let’s get knitting! Finished circumference 7 (8, 9, 10)”/18 [20, 23, 25] cm; finished height from top of ribbing to bottom of heel flap approx 7.5 (8, 9, 10)”/19 [20, 23, 25] cm. Choose a size with about 10% negative ease (i.e., about 10% smaller than the actual circumference of the ball of your foot). Shown in size 8”/20 cm circumference with a 9”/23 cm foot length. Cascade Yarns Heritage Solids (75% Merino, 25% Nylon; 437 yds [400 meters]/3.5 oz [100 grams]): 5660 Grey 1 (1, 2, 2) balls. Note: The sample and swatch used approximately 380 yds [348 meters]. A different gauge or an alteration in leg height or foot length will affect yarn usage. You may wish to buy two balls for all but the smallest size (or, if you intend to make major adjustments to leg height, or you have particularly long feet, you may wish to buy two balls even for the smallest size). 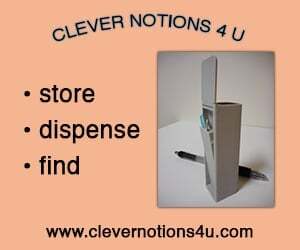 Size US 1 (2.25 mm), or size needed to achieve gauge: your preferred needle(s) for working in the rnd. 3 stitch markers; tapestry needle. 36 sts and 52 rows = 4” [10 cm] in st st in the rnd. Please see our standard abbreviations. This pattern is worked in the round from the top down with a heel flap and heel turn. It begins with a k1, p1 ribbing cuff, followed by the leg, which is worked in the main texture pattern. The heel flap is worked in eye-of-partridge stitch, and the heel turn is a standard round (French) heel. The foot length is to be chosen by the knitter. The toe is a standard wedge toe. CO 64 (72, 80, 88) sts using a long-tail CO or a stretchy CO of your choice. Pm to mark beg of rnd and join. Ribbing: *K1, p1, rep from * to end of rnd. Work ribbing until cuff measures 1 (1, 1, 1)” or 2.5 [2.5, 2.5, 2.5] cm, or to desired length. Note: You will end the sock leg with a rnd 3 of the Texture Pattern; a partial rnd 4 will be worked in the next section as a setup for the heel flap. Work Texture Pattern using chart above or written directions below for 4 (4.5, 5, 5.5)” or 10 [11, 13, 14] cm, or to desired length, ending with a rnd 3. Sock leg will measure 5 (5.5, 6, 6.5)” or 12.5 [13.5, 15.5, 16.5] cm long from CO edge. Note: The heel flap is worked flat over 31 (35, 39, 43) sts. You will work a setup partial rnd, followed by the eye-of-partridge heel flap itself. On the first row of the heel flap, you will place markers at each end of the row to mark the separation of heel and instep sts. Setup: *P1, k1, rep from* to last 16 (18, 20, 22) sts. Pm to indicate beg of heel sts. Row 1 (RS): *Sl1p, k1, rep from * over next 28 (32, 36, 40) sts, k1, turn. Row 2: Sl1p, p to end, turn. Row 3: Sl1p, *sl1p, k1, rep from * to end, turn. Row 4: Sl1p, p to end, turn. Work eye-of-partridge pattern 8 (9, 10, 11) times total. You should have worked 32 (36, 40, 44) total heel rows. Note: If you’ve never worked a heel turn before, it can seem a little confusing at first. The heel turn is worked as a series of short rows which increase in length. 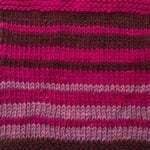 Each time you work a short row, you will notice a small gap has formed in your knitting. The decrease (ssk or p2tog) incorporates 1 st on either side of this gap in order to close it. Follow the instructions, and you’ll soon get the hang of it. Once you have completed the heel turn, you will pick up stitches to form a gusset to accommodate for the natural shape of the foot. Row 1 (RS): K18 (20, 23, 25), ssk, k1, turn. Row 2: Sl1p, p6 (6, 8, 8), p2tog, p1, turn. Row 3: Sl1p, k7 (7, 9, 9), ssk, k1, turn. Row 4: Sl1p, p8 (8, 10, 10), p2tog, p1, turn. 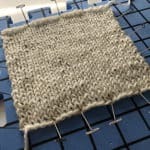 Cont in this manner (knitting or purling 1 more st each row) until all sts have been worked (a final st at the start of each row will just have been slipped); 19 (21, 23, 25) heel sts rem. K across heel sts. Remove marker. With the same needle, pick up 18 (20, 22, 24) sts along edge of heel flap (1 st for each sl st of heel flap plus 2 from leg sts to close any gaps). Pm. Marker indicates separation of instep sts from heel and gusset sts. Work across instep sts in rnd 1 of Instep Texture Pattern (see below). Note: the pattern should be a continuation of the pattern established on leg. Leaving marker next to instep sts, pick up 18 (20, 22, 24) sts (2 from leg to close any gaps plus 1 st for each sl st of heel flap). K to end of rnd; 86 (96, 106, 116) sts total. Note: if you are working on 1 circular needle, all sts will be on a single needle. If you are working on 2 circular needles, distribute sts so instep sts are on 1 needle and heel and gusset sts are on other needle. If you are working on 4 DPNS, distribute sts so instep sts are on 1 needle and gusset and heel sts are evenly split over 2 needles. If you are working on 5 DPNS, distribute sts so instep sts are evenly split over 2 needles and gusset and heel sts are evenly split over 2 needles. These suggested distributions should be easiest to work with. You will begin by working rnd 2 of the Instep Texture Pattern as you already worked rnd 1 when picking up gusset sts. Rnd 1: K to instep, work instep in Instep Texture Pattern (starting with Rnd 2), k to end. Rnd 2: K to 3 sts before instep, k2tog, k1, work instep in Instep Texture Pattern, k1, ssk, k to end; 2 sts dec’d. Work rnds 1 and 2 of gusset decreases until 64 (72, 80, 88) sts rem. All rnds: K to instep, work instep in Instep Texture Pattern, k to end. Rep until foot measures desired sock foot length minus toe length (see below). 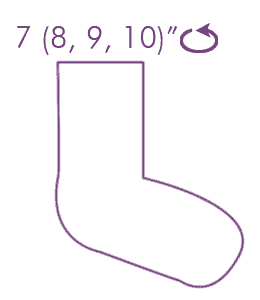 A sock foot length of about 0.25-0.5″ or 0.5-1 cm shorter than your total foot length is recommended. Toe length will be approx 1.7 (1.8, 2.1, 2.3)” or 4.2 [4.6, 5.4, 5.8] cm if you achieved the row gauge noted at the beginning of the pattern. Rnd 1: K to 3 sts before instep, k2tog, k2, ssk, k to 3 sts before heel, k2tog, k2, ssk, k to end; 4 sts dec’d. Rnd 2: K to end. Work rnds 1 and 2 until 24 (28, 28, 32) sts rem. You will have 2 more sts on instep than heel. Note: for a rounder toe, work rnds 1 and 2 until 48 (56, 56, 62) sts rem, then work rnd 1 only until 24 (28, 28, 32) sts rem. Then work as follows. Next rnd: K to instep, k1, ssk, k to 3 sts before heel, k2tog, k to end; 22 (26, 26, 30 sts) rem. Next rnd: K to end of rnd. Next rnd: K to end of heel sts. Graft toe using Kitchener stitch. Rep pattern to make other sock. Rnd 1: *K3, p1, rep from * to end of rnd. Rnd 2: *K1, p1, rep from * to end of rnd. Rnd 3: *K3, p1, rep from * to end of rnd. Rnd 4: *P1, k1, rep from * to end of rnd. Rnd 1: K0 (2, 0, 2), p1, *k3, p1, rep from * to last 0 (2, 0, 2) sts, k0 (2, 0, 2). Rnd 2: P1, *k1, p1, rep from * to end. Rnd 3: K0 (2, 0, 2), p1, *k3, p1, rep from * to last 0 (2, 0, 2) sts, k0 (2, 0, 2). Rnd 4: K1, *p1, k1, rep from * to end. Shannon Donald is a mother of two from Nova Scotia, Canada. When she’s not knitting or chasing toddlers, you’ll probably find her behind a camera. You can visit her on Ravelry as ShannonDonald, or on her blog, fibre.optics, at https://shannondonaldknits.blogspot.ca/, where she focuses on photographic skills for fiber artists.